Our customers often want to call us merely to confirm that we are real and dependable. Why? Because our rates are the best on the Internet-- seemingly unbelievable. 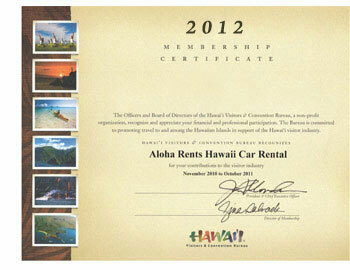 Please take note of our Hawaii Visitors & Convention Bureau certificate. We have been members of the HVCB association since 2009. 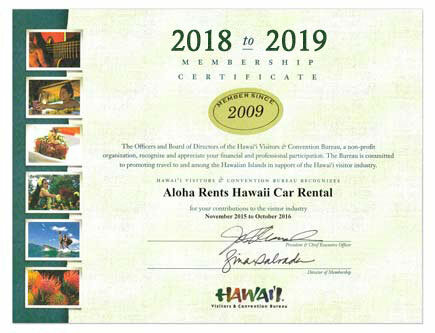 With more than 15 years of experience (learn more), offering discount car rental rates at our airport locations in the Hawaiian Islands, we continually work hard to build a harmonious relationship with six major car rental companies. From our earliest beginnings, the large car rental agencies have offered us the lowest rates found online. Are we "big"? No. We don't offer flight or resort packages. The smaller, more unique lodgings in Hawaii (our personal preference) don't usually offer packages either. We donate to local organizations in Hawaii, such as the Mālama Maui Nui an arm of Keep America Beautiful. Yet, we don't run expensive advertising campaigns to get your attention. We figure we don't need to amuse you in order to win your trust. We simply provide unbeatable prices on rental cars in Hawaii. In the beginning, we offered cars for rent from only two car companies. We were a tiny company with cheap rates. As our web presence grew, other companies asked us to join their fixed-rate programs. Now, our customers happily reap the benefits as these companies engage in multiple price wars for our stream of customers. In addition to discounting their prices, these companies have also individually rearranged their seasons, and offered enticing customer perks so that we always offer the lowest online deals available. We expect you already know our companies (Alamo, Thrifty, Dollar, Enterprise, Avis, Budget). Today, we count on the loyalty of our repeat customers and their word-of-mouth advertising to help us maintain low rates with our partners. So, if you are new to our site, or one of our many repeat visitors-- Welcome! We assume you have visited our website because you are budget-minded. Therefore, it is our sincere pleasure to send you off today with the rental car of your choice, at the best price offered online. Your carriage awaits. Get a car rental today! Airport locations on the Big Island Hawaii, Kauai, Maui, Molokai and Oahu.